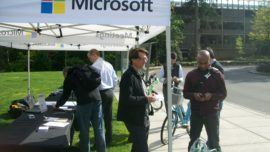 The plan focused on identifying ways to enhance connectivity, sustainability, safety and mobility for students, staff, faculty, and visitors. 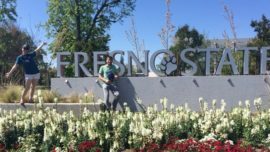 Fresno State is located in northeast Fresno, California, very close to the border between the cities of Fresno and Clovis. Due to Fresno State’s location within the Central Valley, the hot climate can be a major detractor from using an active mode to get to and from campus. Additionally, many surrounding roadways lack bicycle and pedestrian infrastructure and have high vehicle speeds, so the trips can be seen as unsafe. The Fresno State Active Transportation Plan will help alleviate some of the safety concerns and address some of the “hot spots” to help encourage the campus community to choose a more cost effective, active, and healthier mode when commuting to and through campus. 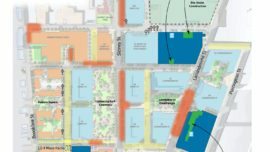 One of the goals of the Plan is to reduce transportation infrastructure costs and parking needs for the campus so that parking garage expansions are a result of land-use decisions and not demand. 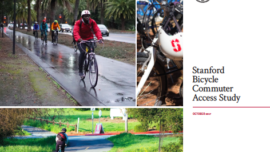 The plan identified seamless integration of transportation choices such as bike sharing, prepaid transit passes, transit hub, bus rapid transit services, trails, separated bikeways, and secure bike parking.